Last Friday, 47 vehicles were involved in a pileup crash which killed one woman, Linda Henderson of Platte City, Missouri. Sergeant Collin Stosberg from MSHP Troop A said poor visibility and road conditions caused a semi truck to jack-knife on I-70 westbound near Oak Grove, which led to the pileup. He said oftentimes secondary crashes can be worse than the first. LEE'S SUMMIT, Mo. — Troopers with the Missouri State Highway Patrol are encouraging people to drive with caution on snow-covered roads Wednesday morning. Last Friday, 47 vehicles were involved in a pileup crash which killed one woman, Linda Henderson of Platte City, Missouri. Sergeant Collin Stosberg from MSHP Troop A said poor visibility and road conditions caused a semi truck to jack-knife on I-70 westbound near Oak Grove, which led to the pileup. He said oftentimes secondary crashes can be worse than the first. “Our goal at the end of the day is for everyone to get home safely. Sadly, we didn’t see that last weekend,” he said. His advice to drivers after analyzing the pileup is to slow down and increase the space you keep between your car and the car in front of you. He said under normal conditions, you should keep one car-length worth of distance for every 10 miles per hour your traveling. So if you’re going 30 mph, you should have three car-lengths separating you from other cars. In snowy weather, you should increase that distance so you have more space to stop and react to anything that happens on the road ahead of you. 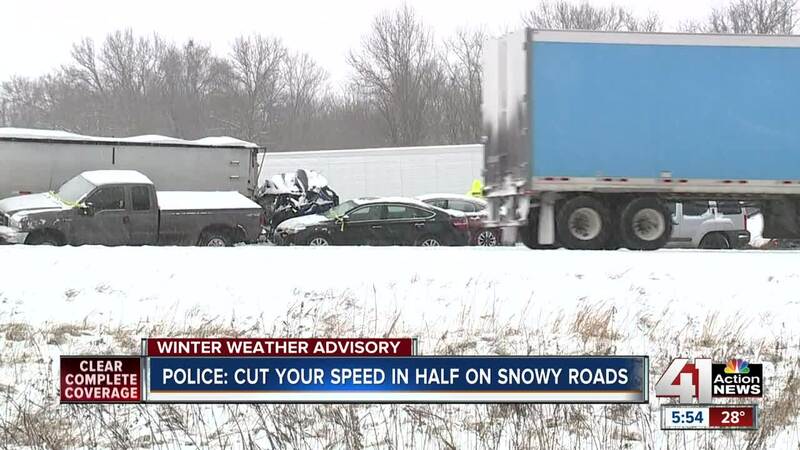 Another way drivers can increase their safety on snow-covered highways is by slowing down. Stosberg said many of the cars involved in the pileup were traveling too fast for the conditions and did not have enough time to react and avoid crashing. “I was talking to some other troopers and even in the weather they were stopping cars at 80 or 90 mph as early as Saturday morning when the roads were still inclement and snowy. It makes you scratch your head and wonder what people are thinking,” he said. If you are involved in a crash on the highway, Stosberg said stay in your car, wear your seatbelt and dial *55 to contact the closest highway patrol headquarters.